A Syrian-American advocacy group with Muslim Brotherhood links and a history of misrepresenting jihadist groups as moderates recently completed a weekend-long training session with left-wing activists on lobbying Congress and how to do demonstrations. 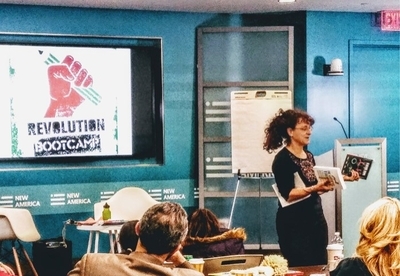 The Syrian American Council (SAC) organized the "Revolution Bootcamp: The 7th Anniversary of the Syrian Revolution," held at the New America Foundation. A group called Beautiful Trouble, which "exists to make nonviolent revolution irresistible," led much of the training. The Syrian opposition "has increasingly become more defined by its moderation, more defined by the breadth of its membership, and more defined by its adherence to some, you know, democratic process and to an all-inclusive, minority-protecting constitution," Kerry said in 2013 during congressional testimony. At the time, however, U.S. intelligence agencies were concerned that "the most radical elements" were poised to dominate the opposition to dictator Bashar Al-Assad. That's exactly what happened, as rebel groups fell in line behind the growing ISIS caliphate. Now the SAC is looking for allies on Capitol Hill to pressure the Trump administration to continue supporting these same groups. The training sessions March 18-19 aimed to help SAC's members and their non-Muslim/non-Syrian partners lobby effectively on their behalf. At a minimum, the SAC is led by Muslim Brotherhood supporters. The Brotherhood wishes to see an Islamic state spread from the Middle East throughout the world. Molham al-Droubi, a key leader of the Syrian Muslim Brotherhood, told the Investigative Project on Terrorism (IPT) in 2013 that many of the SAC's members formerly belonged to the Syrian Brotherhood. An Arabic post on the Syrian Muslim Brotherhood's website from 2014 stated that its ideology stood closer to that of ISIS than to the West. SAC founder Talal Sunbulli was listed in a 1992 international Muslim Brotherhood phone book seized by federal investigators. But last month's training was more about how to persuade American policymakers. Programming included training about storytelling, op-ed writing; a protest to commemorate the seventh anniversary of the Syrian Revolution; and a session on how to lobby Congress. Nadine Bloch, training director for Beautiful Trouble, conducted a session about community organizing. SAC's Twitter feed encouraged followers to read an eponymously named book, Beautiful Trouble: A Toolbox For Revolution, that discusses protest tactics. It also suggested playing a strategy game the group developed. Beautiful Trouble's website lists Code Pink and an anarchist group called the Ruckus Society as partners. Andrew Boyd, a co-editor of "Beautiful Trouble: A Toolbox For Revolution," described the book as "an Anarchist Cookbook for the 21st century, but without the bombs." During an advocacy session, SAC members were taught through role playing how to talk with congressional staffers. SAC's top leaders forged an alliance in a September 2016 declaration with supporters of the #BlackLivesMatter movement and the Boycott, Divestment, Sanctions (BDS) movement against Israel. "The Syrian people in their revolutionary struggle for democracy have identified and publicly expressed solidarity with other democratic struggles, including the Black Lives Matter movement against racist police violence, and Syrian immigrants and refugees stand in solidarity with all immigrants and refugees," the declaration said. Sunbulli was among the SAC members who signed the declaration. The SAC and its Muslim Brotherhood allies monopolized access and influence at the State Department, Kamal al-Labwani, a former ETILAF member, told the IPT. SAC's lobbying, he said, led the U.S. to support extremists who posed as moderates. As a result, actual moderates like al-Labwani were sidelined. Infighting among the radical groups created a vacuum that allowed ISIS to rise and the subsequent occupation of much of Syria by Iranian-controlled militias. SAC Government Relations Director Mohammed Ghanem openly supported Muslim Brotherhood ideologue Sheikh Yusuf Qaradawi, whose call for jihad against Assad and for foreign fighters to go to Syria further inflamed the conflict. "I love this appreciated scholar very much, even I adore his jurisprudence," Ghanem wrote in a 2012 Facebook post. "I consider this a great honor. And now, I am over the moon." State Department officials still regarded Ghanem as a "very good contact," former State Department Syria Opposition Outreach Desk Officer Khulood Kandil wrote in a Jan. 20, 2014 email obtained through a Freedom of Information Act (FOIA) request. Ghanem maintained an extensive network of contacts at "all levels of the Syrian opposition." Kandil was romantically involved with Ghanem, a Nov. 22, 2015 post on Ghanem's Facebook page shows. Her uncle, Hisham Kandil, served as Egypt's prime minister during the Muslim Brotherhood's brief rule. In his effort to sell U.S. officials on supporting rebel groups, Ghanem downplayed the close documented relationship between the FSA and groups like the al-Qaida linked Ahrar al-Sham in a September 2014 op-ed. Ahrar al-Sham's commander at the time of his column formerly headed a FSA unit, and the jihadist group often fought alongside FSA forces. "Americans never felt this insecure when Ahrar al-Sham or other 'extremist' rebels established safe havens inside Syria. This is because when Syrian rebels – whatever their political beliefs – conquer territory from Assad or ISIS, they do so to seek greater opportunity and freedoms for their homeland," Ghanem wrote. "Contrary to some news reports, rebel fighters are not barbarians. " Amnesty International accused Ahrar al-Sham and other FSA-linked groups of war crimes in 2016. Ghanem condemned the Obama administration in 2012 for labeling Jabhat al-Nusra as a terrorist organization. The al-Qaida affiliate should not be designated because it "cooperates closely with the Free Syrian Army" and because "has achieved military successes and has delivered critical civilian aid." SAC's campaign of lies extended to the Syrian fighters it brought to the U.S. while presenting them as moderates. For example, Col. Abdel Jabbar Akidi appeared via satellite at a June 2014 Washington news conference the SAC co-sponsored. Akidi is "[o]ne of the moderate, vetted generals who have received U.S. assistance," SAC's press release said. But a video from 2013 showed Akidi celebrating with ISIS fighters after his FSA forces jointly seized a regime airbase near Aleppo with the jihadists. In another video, he claimed near daily contact with ISIS, calling his relationship with its leaders "almost brotherly." He defended ISIS, saying that the bad things that were said about them were "overinflated," including allegations that ISIS killed fellow Muslims who it accused of apostasy. SAC's work with Akidi wasn't isolated to this press conference. Ghanem noted that the SAC facilitated a 2015 interview that Akidi had with CNN's Christiane Amanpour. Sheikh Mohammad Rateb Nabulsi was another terror apologist whom SAC brought to America. He came on a multicity fundraising tour in early 2014. Nabulsi's website contained an April 2001 fatwa sanctioning suicide bombings against Israeli civilians. A March 2014 New York Post article stated that the SAC submitted Nabulsi's visa through the Syria Desk at the State Department where Kandil worked. Ghanem glossed over Nabulsi's radicalism in State Department emails after then-New York Post D.C. Bureau Chief Geoff Earle asked the State Department about Nabulsi's fatwa, an IPT article linked to the fatwa, FOIA documents show. "I couldn't find anything on the website that incites violence against Jews around the world. If you find something, please alert me," Ghanem wrote in a Jan. 17, 2014 email to Kandil. Nabulsi is "an influential voice of moderation with a huge following in the Levant, not just Syria," Kandil wrote in an email to then-Deputy Assistant Secretary of State for Near Eastern Affairs Lawrence Silverman. At the time, Nabulsi's fatwa supporting suicide bombings remained on his website. It was gone less than a month later. SAC's effort to make itself more effective at obtaining help for its friends in Syria should be of the utmost concern considering its track record for duping American officials into supporting groups opposed to American values.